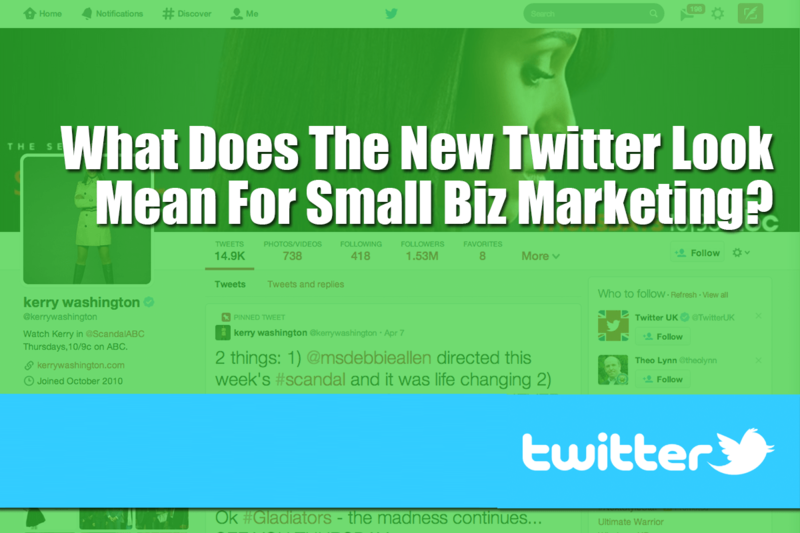 What Does The New Twitter Look Mean For Small Biz Marketing? 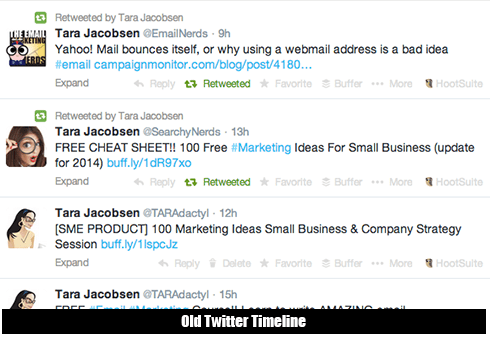 You are here: Home / social media / What Does The New Twitter Look Mean For Small Biz Marketing? 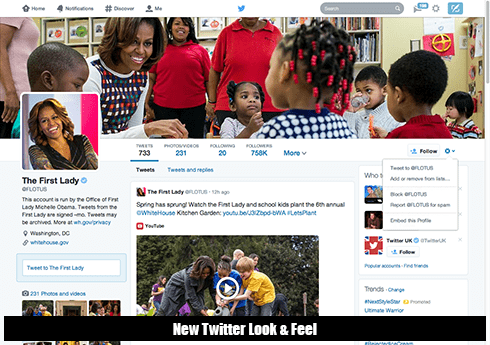 Twitter is changing how your profile and stream looks, whether you like it or not. 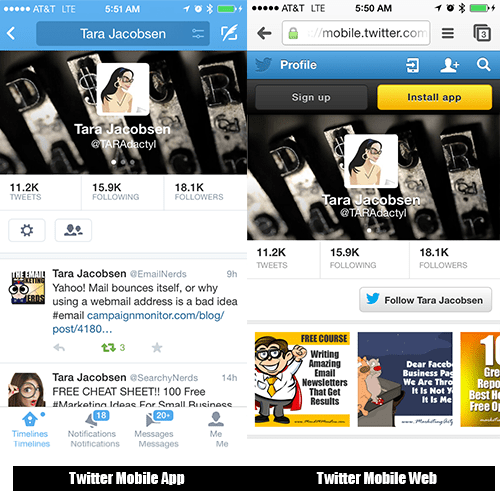 The first thing that jumps to mind when I see it is that it is totally a Facebook clone now which makes me sad. 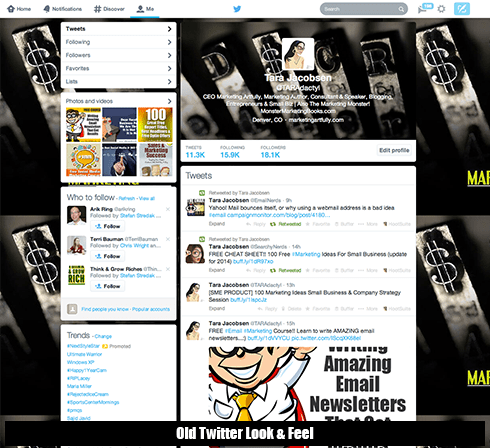 One of the reasons I like Twitter so much is the ease of use and clean layout. This update seems to make things a little more fancy…sigh. In the new version, there is a wide-wide graphic at the top and underneath are your tweet stats including number of tweets, photos and videos, following, followers, favorites and more (the “more tab” holds the lists). There is no background image, nor is there a way to modify the arrangement or add any additional personal information. I liked the old look and feel much better as it had the information about the person right up front and center where I could see it. I actually use that information a lot when deciding whether or not to follow someone. Those bits have moved to the left under the profile picture. According to Twitter, the new timeline will allow you to “pin” an important post to the top and your highest quality tweets (the ones that people like and retweet the most) will be a larger size than the old ones. It is easier to select which view to see of the profile, right now I see tweets, tweets and replies, but supposedly you will also be able to choose only tweets with photos or videos. The size of pictures included does not seem to have changed. It appears that 800 height by 1200 width is still the aspect ratio that they display. If photos are larger they display the middle area like Facebook does. I pulled both the new and the old on both the Twitter App and the Google Chrome browser and this looks very similar to the old desktop Twitter. One thing to note is that the only part of the wide-wide picture that shows is the middle. 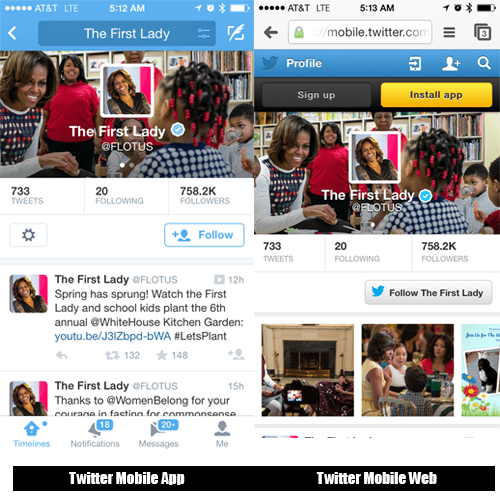 We will have to watch where those pictures “cut off” so as not to have a ridiculous header in mobile. Not much change here but important to note that on both versions it is important to have some of your posts include photos. 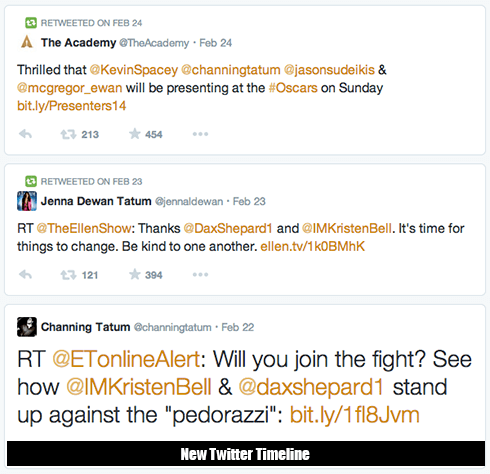 What does this change mean to your Twitter marketing efforts? How have the recent changes at Facebook hurt your views and what should you do next? Is Pinterest right for your business and if so, what should you be “pinning”? 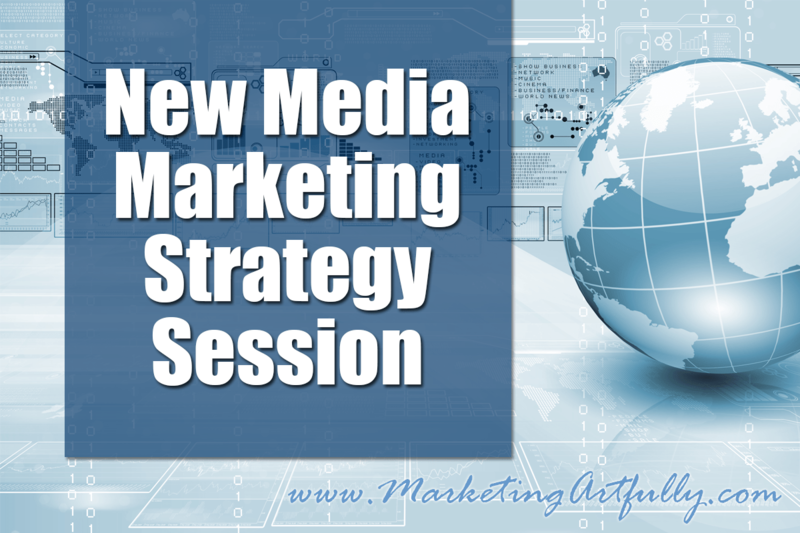 It is almost impossible to keep up, but with a New Media Strategy Session, you will know that your business is on the cutting edge of what is working today on the social networks!